Are you tired of shredding? Looking for an alternative way to discard papers but still protect your information? If so, then you’ll love the Guard Your ID stamp, available at the Container Store as well as Amazon.com. Locate the personal information you want to obscure — such as a Social Security number or account number — press down the self-inking stamp, and voilà! A tidy box of hash marks now makes it impossible to read the information. Now you can simply recycle that piece of paper. A rolling version of the stamp is also available for those instances where you need to block out a larger area. (Here it is at Amazon. It’s also at the Container Store but in person, not on-line). I bought both versions — the stamp and the roller — at the Container Store a few days ago, and they seem to work just fine. Be aware, however, that they are not recommended for glossy surfaces such as most catalogs, magazines, and brochures. 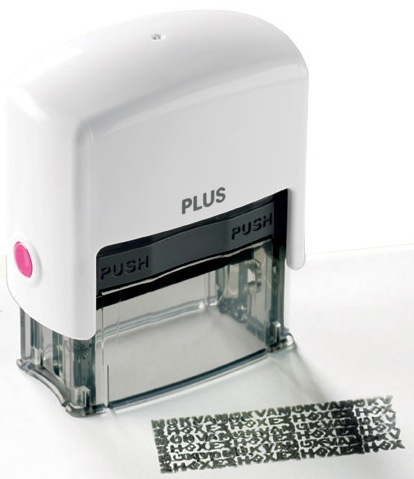 So stop shredding and start stamping!